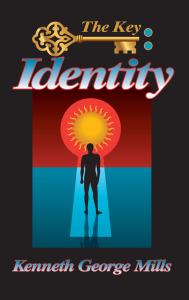 Kenneth George Mills’s book The Key: Identity is a collection of his spontaneous lectures, termed “Unfoldments,”™ focusing on the answer to the question concerning man’s true nature—the big “Who am I?” That’s right—the Answer! That alone makes this book very exciting, or scary, depending on how you look at it. Most of us rather enjoy the countless possibilities of conjecture. And with this age-old question there has always been plenty of room for gab, leaving it all very mysterious and awkward for application in people’s lives. Dr. Mills is different. He lays it on the line, tells us what it is, and gives us more than an armload of practical advice for engagement. But is this what makes this book great? No! What makes this book great is the man behind it. Would you rather take lessons on flying an airplane from the manufacturer who designed the plane and can tell you all about how it is supposed to fly, or from a pilot who has had years of actually flying this plane and has learned more about flight than a manufacturer could ever imagine? Dr. Mills is like the experienced pilot. He came to know the Design for Living that he speaks of by engaging it, and by being it all the time, and thus he continued to break barriers to new life experiences. In other words, he was not just a philosopher. He realized the Principle of Life and exemplified it in action … not just in words. This action was no small accomplishment. Besides being a poet-philosopher who gave amazingly coherent, extemporaneous lectures, he achieved tremendous success in business, architecture, fashion design, painting, singing instruction, and choral conductorship of The Star-Scape Singers, not to mention former successes as a piano teacher, adjudicator, and concert pianist. If one was fortunate enough to have been in this man’s life, one would have seen that it was not simply his apparent accomplishments that were of significance. It was the Energized State manifested as this man that was so awesome to perceive. It is this State that his words point to in The Key: Identity. The Key: Identity is a book filled with chapters that break the boundaries of ordinary explication. Titles such as “The Beauty Unfoldment,” “The Need of Change,” and “The Magician” are chapters that take an idea capable of being conjured by a mind but challenge its mundane interpretation and go to a level almost beyond understanding, and in such a musical way that the reader is forced to abandon logic and rise to a higher feeling state to receive it. To cause your mind to tingle with the promise of the new discoveries of Light. To be continued. Paul Sargia is a freelance scriptwriter living in Norwalk, Connecticut. A similar article was published previously in Concepts magazine. ← THE KEY IS IDENTITY – MP3 Downloads Now Available!